During my time at the AAEEBL ePortfolio World Summit 2011, one of the stand-out sessions that I attended was Pace University’s: “ePortfolios and Faculty Development: Charting the Impact on Teaching, Learning and Campus Culture.” What I found really interesting about the session was that it didn’t focus on one particular aspect of their ePortfolio program. In fact, it covered many different pilots including student life, career services, and assessment. In this post, I’m going to cover Pace University’s faculty development practices and their career services pilot. The session started out with an overview of faculty development practices for the preparation of implementing ePortfolios in the classroom. Through an application process, 40 faculty members were selected to participate in a “teaching circle“, which focused on basic technical skills for their ePortfolio platform (Mahara), as well as developing eportfolio assignments and eportfolio rubrics. They conducted a post teaching circle survey, held a follow-up meeting, and conducted classroom demonstrations for students. What I found interesting about Pace’s approach was that they didn’t require those who participated in the teaching circle to use ePortfolios. There was a small stipend to go through the teaching circle and a follow up stipend for those who chose to use ePortfolios in their classroom. I thought it was great idea to introduce faculty to ePortfolios and allow them to get their feet wet before they decided whether or not to use eportfolios the following semester. There was a great quote from one of the faculty members that resonated with me: “I’m in love (with ePortfolios), but I’m not quite comfortable with the relationship.” Based on the feedback from their survey, future teaching circles will have a heavier focus on technical skills building. They have also built some terrific ePortfolios resources on Pace’s Center for Teaching, Learning and Technology website: http://pace.edu/ctlt/eportfolios/tutorials. Even though the resource website has a heavy focus on tutorials for Mahara, I found the links for faculty at the bottom very helpful. So helpful, in fact, that I had to tweet about it! I was excited to hear about Pace University’s career services pilot because I don’t think there’s a lot of research (right now) on the impact of ePortfolios on employment. Also, after conducting my senior capstone on the Impact of Web 2.0 Tools on Employment, I was really interested to find out what has changed (and what hasn’t) in the past two years. The University invited employers from various economic sectors for a focus group session — breakfast included. Nearly all of the employers didn’t know what an ePortfolio was, but after viewing student examples 90% said they would look at an eportfolio when considering a candidate for employment and 78% thought it made a great addition to a resume. 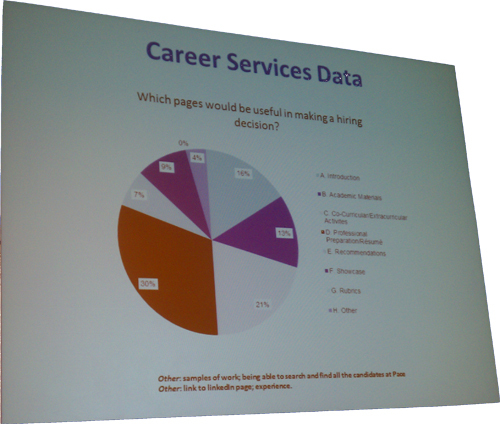 When answering the question: “Which pages would be useful in making a hiring decision”, the participants valued professional preparation/resume pages (30%) and co-curricular/extracurricular pages (21%) above everything else (see pie chart below). I wasn’t surprised that the employers weren’t as interested in the other pages: introduction, academic materials, recommendation, showcase, rubrics, and other. While these pages are important for students to develop both academically and professionally, I’m sure hiring managers simply don’t have the time to look at every page in a prospective employee’s ePortfolio. One of the participants explained that the extracurricular/co-curricular activities pages are valuable because they show the student’s ability to multitask and interface with clients. 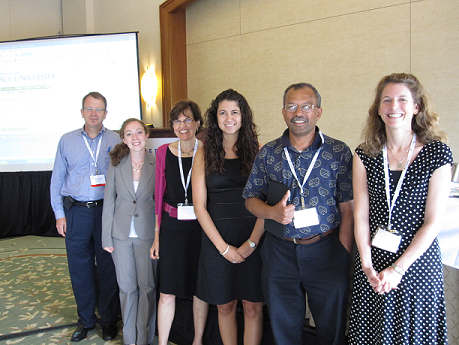 If you weren’t able to attend the AAEEBL World Summit, but would like to find out more about the sessions I would recommend checking out the #AAEEBL11 hashtag on Twitter and looking out for additional updates on the AAEEBL website as well as the ePortfolio group/blog on the Commons. XHTML · CSS Packaged by Edublogs - education blogs.